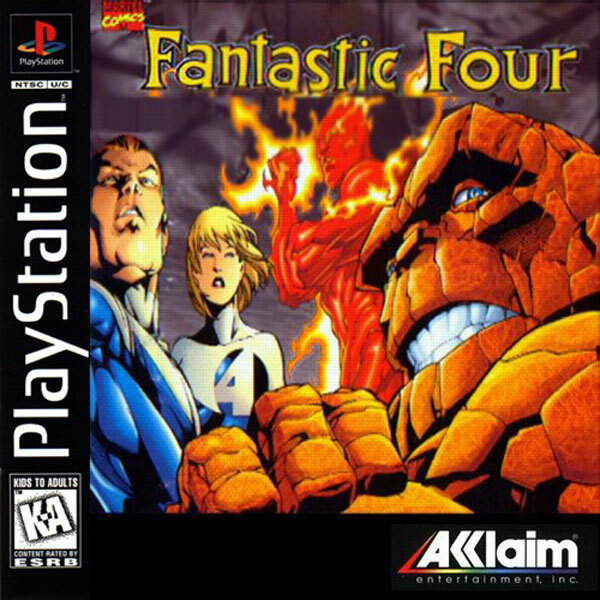 Fantastic Four on the PSOne wouldn’t be the first time that members of the group would get their own game, that honour would go to the PC graphical adventure title Questrobe featuring Human Torch and the Thing, but it marked the first time the Four would be together in their own video game and on a console as well. 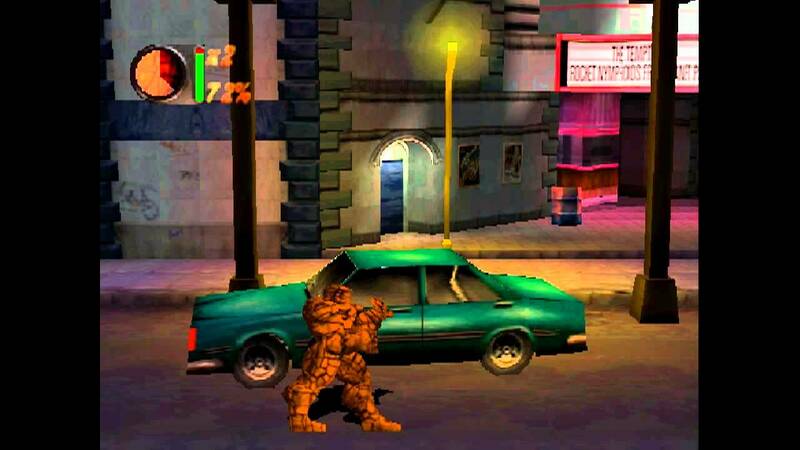 Like a lot of Marvel characters, primarily Spider-Man and the X-Men, and even the two together, the company that would give the Fantastic Four their first very own video game would be Acclaim, who have done right by comic book properties in the past, mainly their own, but did give the world Maximum Carnage as well. For as much as people feared the Acclaim logo in the 8 and 16-bit era, their efforts on the PlayStation were somehow even worse. Before the release of Fantastic Four they had already produced Iron Man and X-O Manowar in Heavy Metal and Batman Forever: The Arcade Game. For those curious about how Fantastic Four on the PSOne is quality wise, I point you to the last two games I just mentioned. Fantastic Four is a legendary bad game that would set an unfortunate precedent for the rest of the Four’s video game career. Yes, that is what The Thing looks like in this game. There’s decades of source material in which to draw upon when creating a Fantastic Four game, but their breakout game has no story in which to speak of. 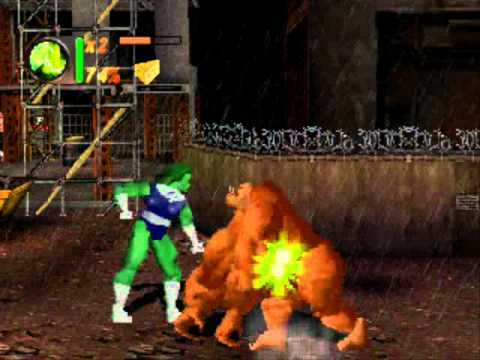 You go from one level to the next, punching bad guys until you reach the final level and fight Doctor Doom at the end. Like a lot of other super hero games of the era, Fantastic Four is a beat-em-up and that doesn’t always have to be a bad way to do a super hero game, just look at Capcom’s The Punisher, Konami’s X-Men and even Acclaim’s Maximum Carnage. What those three games have in common is that they’re played on the 2-D plane, which isn’t the case for Fantastic Four as it’s 3-D and that’s the first of its many, many faults. Often parts of a level will obstruct where you can go, block helpful power-ups or even cause unnecessary death. In level two for example there are craters that cause immediate death that you’ll just stumble into, or a precariously thin bridges that are impossible to judge your position on, also leading to death or a loss of health. The poor graphics are not just limited to the environment, but to the characters as well. The Thing, a character you really want to use in a beat-em-up, looks less like he’s made of rocks and more like he’s assembled out of silly putty with black drawn in after wards for a rock-like effect.. She-Hulk, my favorite character to use, towers over both the rest of the Fantastic Four and stage enemies, giving her a weird perspective where it looks like most enemies only come up to her knees. The enemies don’t fare much better with stage enemies looking like blobs that just happen to have limbs. Don’t ask me what She-Hulk is punching, I couldn’t tell you. Looks can be forgiven if a game is fun to play, but this game plays about as bad as it looks. You have multiple degrees of attack and an unnecessary amount of throws with one trigger for throwing enemies into the background and another for away because 3-D, but hits don’t feel anywhere close to satisfying and enemies have a tendency to swarm you when playing solo, constantly knocking you down in frustrating stun locks. One of the more impressive features in this game that I’ll give it credit for is that you can play four players even by yourself with the computer taking over for the other three players. While it’s a nice bonus, I want you to imagine how frustrated you get when you play a game like say, Resident Evil 5, where your AI partner wastes ammo and runs into walls. Now I want you to think about how three characters function in a PSOne game controlled by a computer and yes, it’s that bad. Your AI teammates eat through their lives and your continues like they’re going out of style and will follow you down a pit like a mindless lemming. If you have a multi-tap, three extra controllers and some friends you can play up to four players, which is cool, but there’s no reason for one person to play this game, let alone a group of them. There are a lot of great super hero beat-em-ups that you can play but Fantastic Four isn’t one of them. From the bad graphics, poor feeling controls and awkward looking characters, there’s nothing in this package to recommend to anyone. It was clever for the developer to allow players to play multi-player by themselves via AI controlled teammates, but they do way more harm than good, making the feature a back of the package selling feature more than anything. As we start Fantastic Four month, we’re going to look at some games of questionable quality, but this one is by far the worst.